Heat oven to 350°F. 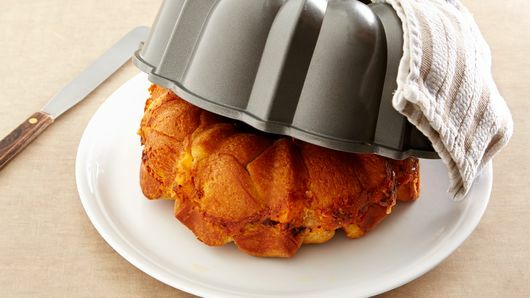 Spray 12-cup fluted tube cake pan generously with cooking spray; set aside. 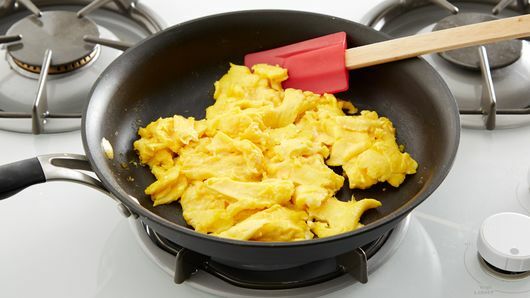 In 8-inch nonstick skillet, melt 1 tablespoon of the butter over medium heat; tilt pan to coat. Add eggs. Reduce heat to medium-low. Cook until firm but still moist, stirring frequently. In small microwavable bowl, microwave remaining 3 tablespoons butter uncovered on Medium-High (70%) 30 to 45 seconds or until melted. Add 1 tablespoon of the melted butter to bottom of pan, brushing with pastry brush or tilting pan to coat halfway up sides. Separate dough into 8 biscuits; cut each into sixths. Coat biscuit pieces with remaining 2 tablespoons melted butter; place half of them in bottom of pan. 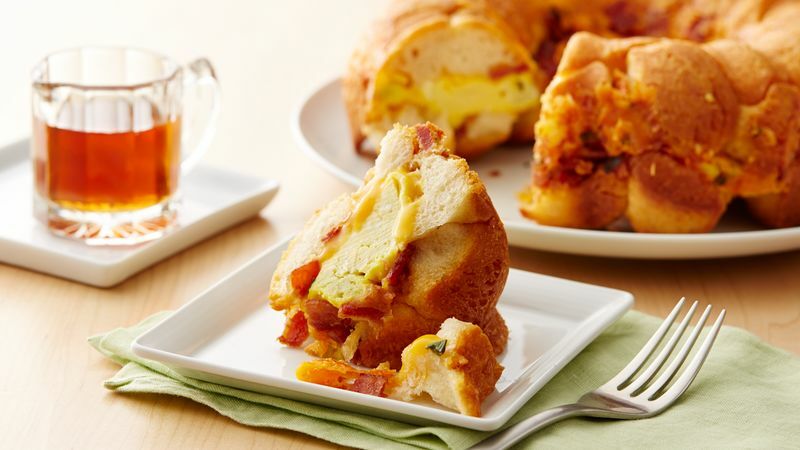 Layer with 1/2 cup of the cheese, half of the bacon, the scrambled eggs, 1/2 cup of the cheese and the green onions; add remaining bacon, remaining 1/2 cup cheese and remaining biscuit pieces. Bake 30 to 35 minutes or until deep golden brown. Cool 5 minutes; run metal spatula around outer and inside edges of pan to loosen. Turn over onto serving platter to serve. Guarantee success by generously spraying pan with cooking spray and buttering biscuit dough as well as the pan bottom before baking. 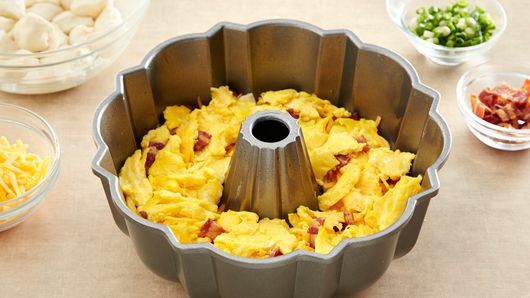 This will help ensure a nonstick release when it’s time to serve to guests. Serve with a side of maple syrup to add a bit of sweet to this savory breakfast. Find packages of precooked bacon in your grocer’s refrigerated aisle, next to the uncooked bacon.